Nelson's Preacher's Sourcebook was issued as an annual from 2002 to 2009, but starting with this edition it will focus on a special topic. There's that same wealth of sermons, outlines, illustrations, quotes, notes about church history, and worship ideas (including hymns, prayers, and Scriptures). Features articles on apologetics and evangelism. 448 pages, softcover with CD-ROM. 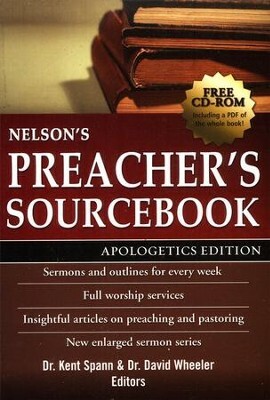 The 2011 edition of Nelson's Annual Preacher's Sourcebook focuses on apologetics. Inspiration doesnt always have to come from the mountain top. God can just as easily use a resource like Nelsons Preachers Sourcebook Apologetics Edition to give you fresh and new ideas for your sermons, small group meetings, and seasonal gatherings. With suggestions for creative outlines, scripture text, preaching techniques and historical notes, use the sourcebook as a jumping off point when talking to God about the message He wants you to deliver. I'm the author/artist and I want to review Nelson's Preacher's Sourcebook, Apologetics Edition with CD-ROM.